Do you feel quite adventurous? Dubbed as the summer capital of the Philippines, Baguio City offers a lot of exciting activities. Aside from exploring the city’s pine trees, strawberry farms, cold weather, and amazing culture, Baguio summer experience would not be complete without horseback riding. So, are your family or friends planning for a Baguio blast this summer? Well, you better check out Wright Park – horseback riding, cool weather, and wonderful sceneries all in one! 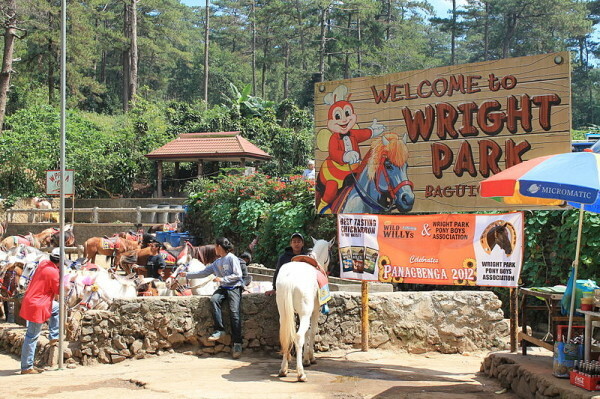 Wright Park is one of the many scenic parts of Baguio. It is located at the city’s eastern part and in front of the main gate of The Mansion (the official summer residence of the president). Wright Park’s main features are the “Pool of Pines” and the Park Circle. Pool of Pines is a shallow elongated rectangular body of water, while the Park Circle is a beautiful spot located at the park’s other end. Wright Park is the perfect place for children and adults who love to ride a horse. In fact, Wright Park is often mistakenly called as “Ride Park”. There are some horses available that may be rented and taken out along South Drive, Mines View Park, or to Outlook Drive. Horse-renting service providers also provide an accompanying guide or “Pony Boys” so beginners do not have to worry about their first horse ride. Meanwhile, if you intend to take out a pony, it is advisable to first agree on the hourly cost to be charged. Wright Park is usually crowded with local and international visitors during sunny weekends and holidays. After your horseback riding activity, you can walk around and explore the natural and cultural beauty of Wright Park. When you walk beside the pool, you will see tall pine trees and decorative street lights line both sides of the access road. In the park, you will also find some native Igorots, dressed in their native and ceremonial attires, who are willing to pose for a photograph. Then, at the park’s Mansion end, native handicrafts are also sold by some Igorot vendors. Well, these are just some of the things that you can do in Wright Park. Hence, there are still some other areas in Baguio where you can enoy other magnificent stuff that the city has to offer.